(The original development for this was buried halfway through another large thread, so restoring it here). This is the current version. Basically, the primary issue I considered to be the Orb of Delirium/Runes of Malediction Combo, which is 18 HP with DR 2, which is a LOT. That combo I found too swingy, if it DOES come out then he's very difficult, if it doesn't then he's really quite harmless. Basically, by weakening Profane Summons/Cursed Effigy I bought down his best plays, by giving demons/his two bad relics extra plays I bought up his low end for more consistency. There's also a different flip mechanic which is quite cool, he's basically invulnerable most of the time, but has brief bursts of vulnerability where you try to kill him in one-two turns. However, I reckon I should be able to rework it so that it doesn't need the card changes. The point of the change to Profane Summons/Effigy are to make the Runes + Orb combo less LIKELY to happen. They do indeed make it less likely to happen, but they also don't make it any less crippling when it DOES happen. If I have a way to weaken that combo, I can take both card changes out. I have three main ideas I would like feedback on. Option one is the simplest, just remove the combo. I think the simplest implementation would be "Damage dealt to Orb of Malediction is irreducible". Both Orb and Runes would be strong walls in their own rights, but they wouldn't work together so well. That means that H-1 Profane summons isn't a problem. Option two is destroy at end of turn. The idea is that at the end of the turn, if both Runes and Orb are in play, Apostate destroys one (probably the orb, destroying the Runes has issues if Effigy is about) and does something as a consolation prize (most likely dealing everyone psychic damage to fit the name). Option threeis destroy at start of turn. If we go this way, the hero turns will have the Runes + Orb wall and not much else they can do. So I'm thinking it would be something like destroy the orb and do *effect* based on how much HP it had left, that way the heroes have something meaningful to beat on for their turn. This one is more interactive, but also potentially kind of punishing. Draft idea would be something like "If Orb of Delirium and Runes of Malediction are in play, Orb of Delirium deals each hero that did not deal it damage in their last turn 4 psychic damage, then destroy Orb of Delirium." Just off hand he's not invulnerable on his front side. If the first hero kills the last relic then the others are free to whail on him in their turns. Yeah, that's intended. Without that, in the situation you mention you're just kind of sitting on your hands for the rest of your turns, as there's nothing meaningful to hit. You will tend to deal a lot more damage during his flipped turn! I usually don't like to play on Advanced mode, but when I play your Apostate I basically use advanced rulings for the flip side. Flavor is good, but it doesn't feel right to me. Just an opinion of course. Option three sounds good btw. Good point about the Relics, will fix. This version of Apostate has the combo being even more obnoxious. With normal Apostate you can at least hit Apostate himself while you try to figure out a way to kill the Orb. Sure, you can't kill him, but you can wear him down. This version has him being not a viable target when the relics are up, so it does really completely shut you down. The issue I had with him is that the orb+runes combo, which IS good (and frequently gotten via Profane Summons)... is kind of all he has? The Demons are all fairly sucky, Apocalypse is pretty easily countered, and a lot of his relics are also quite bad with the exception of Orb, Runes, Effigy and maaaaybe Periapt. Hence my trying to pump up the rest of his bad plays and bring this one down. I think it's fair to say with normal Apostate if you removed Effigy/Runes you would bring him down to sub-Ambuscade levels of difficulty. I do remember the first game I played against Apostate was four turns playing Gauntlet, Imp, Imp and Fallen Angel, then we killed him before he did much of anything. He's a bit too swingy for me. Personally, I feel Runes of Malediction by themselves are a good "puzzle" kind of target by themselves, that is a LOT of damage reduction and it is difficult to get through it efficiently (particularly when Effigy is around). Tripling the HP doesn't substantially change that calculus. I'm struggling to find a good effect for option 3. The issue is that you can have Apostate do *whatever* if the Orb is still around at start of turn and has such-and-such HP, which works overall, but it's not that interesting for the heroes. For us, the challenge is basically "Damage this thing with DR 2 as best you can" which is already what Periapt of Woe, Runes and by extension Effigy do, so it gets a bit annoying in Apostate's deck. In another deck having a sort of Electro Pulse explosive style you-must-kill-this with low HP but high DR is a fun mechanic, but in Apostate's it's just another slog against this high DR relic. -Damage dealt to Orb of Delirium is irreducible. -At the end of the villain turn, if Orb of Delirium and Runes of Malediction are in play, Orb of Delirium deals each hero target 2 psychic damage, then destroy Orb of Delirium. Personally, I like option 2 because it is challenging, a little complex without being overly so, and gives a fun thematic feel overall. Destroying the orb automatically and doing damage also adds an element to the fight that causes players to really think and work on what to fight; A. 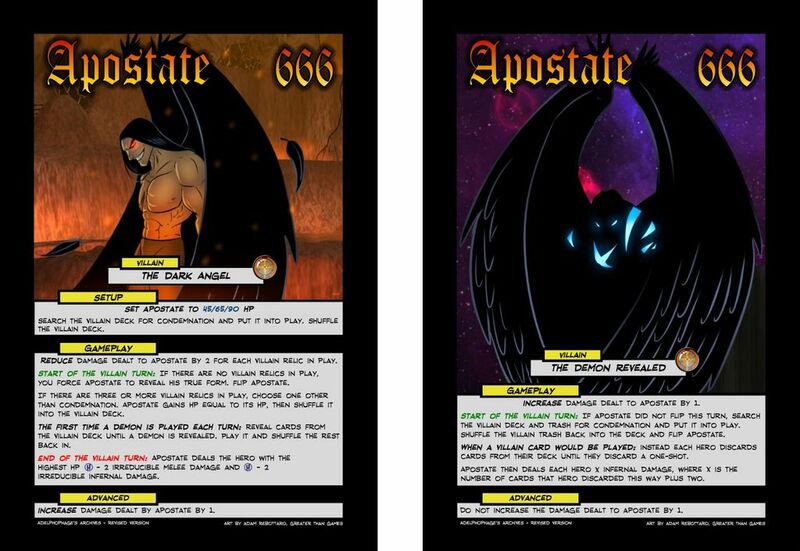 Can we beat Apostate fast enough or B. Is it worth killing the orb or taking the damage to just whittle away Apostate more. Both things players can think about which adds an element of fun and urgency to the game. Bear in mind with option 2 you generally don't wind up making much of a decision - he will usually play both on his turn, then Orb instantly blows up. Also, with this promo you don't really have the option of ignoring the relics and hitting Apostate, as he is shielded by them. Hmmm, that's a solid point. Maybe the 1st option then. I actually like option 2. Maybe make it start of turn? Or how about something like the Orb makes damage to Apostate irreducible, but if it takes no damage by the end of each hero's turn, it deals that hero 3 or (H) psychic damage? Option 2 at the start of turn is option 3, which works, but it does give you a turn of beating on the 18 HP, DR 2 wall, which is what we were trying to avoid.... There are some interesting start of turns things that could be done, but I think they'd have to be combined with some other effect that makes the Orb a more practical target. For your second idea, so... Orb is out, and it means we CAN hit Apostate effectively, which is nice, but we also have to whittle down the Orb otherwise it blows our brains out, which means we also eventually destroy our source of irreducible damage. It's a very cool idea, but I dunno given the constraints of this deck and this card it fits in that well. For example, if we get it on turn 1 and Apostate is on 66 HP, we're probably not going to be able to burn him down with irreducible before it kills us. That means we're in the same old 18 HP DR 2 wall, with the added horror that everyone HAS to deal it damage (through DR 2) each turn or our brains implode. (End of villain turn): If Runes of Malediction and Orb of Delirium are in play, Orb deals each hero target 2 psychic damage and all damage is irreducible until the next villain turn. It gives an AoE blast which hurts, but also it makes everything irreducible, giving you a chance to clear the logjam of tough relics. It's still 18 HP to get through (possibly 24 for Effigy), but more practical. Okay, after some more work, I think the cleanest option is version 2. Version 1 involves remembering a card does a thing it doesn't say on the card, and Version 3 involves having to either deal with The Wall for a round and/or weakening the wall, which brings in the same problem as version 1. So Version 2, one or both parts of the combo blows itself up. It kinda has to be the Orb that blows up as often Runes are in play via Effigy, so even if the Runes did blow up they might just come right back. So Orb blows up, and what does it then do? I'd just go with simple, as you're already introducing an element of extra complexity via the interaction in the first place. - Okay, figured out a mechanic I don't mind to deal with Orb + Runes. The issue really was that he was too spiky, sometimes he gets out a million relics behind a wall of Orb/Runes and you can't do much for 3+ turns. One game started with Effigy + Runes + Orb + Periapt + Tome, and it was NOT good. We couldn't damage anything appreciably with what was in our hands, we couldn't draw new cards, and he was murdering us in the meantime. If there is some way to smooth out having way too many relics, then Profane summons in general and Orb + Runes in particular become less obnoxious. So, the new rule is at the start of his turn, if he has 3+ relics, he absorbs one, gaining HP equal to it and shuffling it into his deck (he can't absorb Condemnation". This means if you do get the Orb + Rune wall, at worst you only have it for one round (and it's worth damaging the Orb a bit, as it lowers his healing). Runes + Orb is still a very strong combo, but it's usually only a turn of lockdown, rather than potentially the rest of the game (god, Fallen Angel can be annoying...). In honesty, I've had games, possibly even the majority of games, where the reabsorbing artifacts hasn't come up once, but I've also had games where it's saved us from a totally abysmal turn one or two by at least helping to clear up an early, big Profane Summons. - As he sometimes gains HP from his relic absorbing, he needed to have that mean something, given he doesn't take a lot of damage early on. So to give him room to heal, I gave him a higher MAX HP than STARTING HP. The starting HP was a number I arrived at after careful balancing, the Max HP could be any old arbitrarily large number, really. And I think I'm happy with the specific arbitrarily large number I chose. It looks quite good up there. 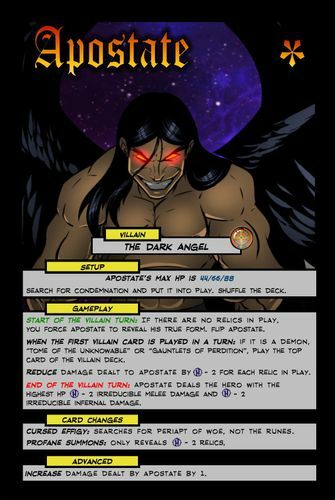 - His extra card plays have changed somewhat - now Gauntlet and Tome don't get extra card plays, and his demons, rather than playing the top card, specifically get another demon. Pairs of Imps are particularly annoying, but still constitute a fairly weak turn for him. - The sunlight damage has been removed from his Demon Revealed side, it was a bit hacky and with the rebalancing not needed. At long last, Apostate is the edgelord he was always meant to be. :V Looks good! He looks very interesting, with the a big difference between his sides. I love the 666 HP. That damage for discards effect got me thinking, and I did some analysis on One-shot mix for different heroes. Turns out that the number of one-shots in a deck varies wildly - from Bunker's 9 to The Sentinels' 32 - so the average damage dealt would be equally variable. 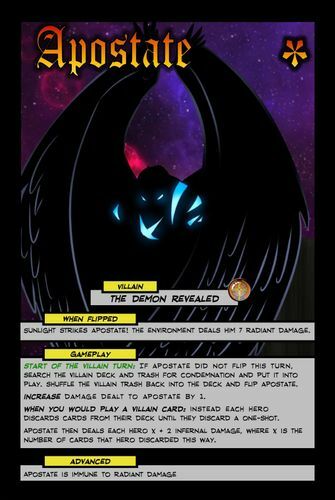 Bunker, Legacy, and Captain Cosmic are particularly vulnerable to The Demon Revealed. Tachyon, Setback and Nightmist have much less to fear (The Sentinels are an interesting case, since each one would be dealt damage separately and they are low HP their wealth of One-shots is almost necessary to keep them from being wiped out). The Demon is side is a bit variable, but it only happens 1-2 times a game. But you're right, it is a little harsher on some heroes. The issue with that turn is that he can't play a normal card (as Relics or especially Profane Summons will mess up the turn), but he needs to do something so it's not just a free turn. 3-4 damage to all seems fair, but I wanted it to be variable so it's a little more interesting. To keep consistency, it could be discard APOSTATE'S cards till you get a one-shot and then deal everyone that plus 2. That is simpler and even for each character, but the issue is that it can be VERY variable. As each hero currently reveals their own cards, sure, that one hero might take seven damage, but that is at least just one hero, they're unlikely to all get very unlucky. Whereas if you get unlucky with Apostate then that could be the entire team gone.